Water heater gas line repair done right. A gas water heater is more energy efficient than electric, and most systems will run for decades without any problems. However, you need to keep an eye out for the problems with the gas line so that you can have them repaired as soon as possible. Here are some of the warning signs to look out for, and what you should do if you suspect that you have a gas leak or malfunctioning line and need a water heater gas line repair. 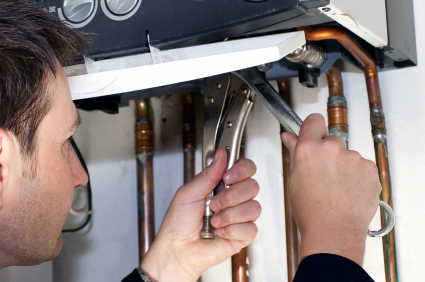 Most water heater gas lines are stationary, and they rarely have problems. Unfortunately, you can run into challenges quickly if connectors or line diameter is incorrect. Another problem is a pinched line that can allow a small leak to form. This is why it’s important to work with knowledgeable, licensed professionals when you’re ready to add a line to your home. Water Heater Gas Line Repair | Dangerous? Natural gas is an odorless and colorless substance, so the gas companies actually add a chemical that produces the notable rotten egg smell. There may also be a hissing sound due to the pressure in the lines. If you ever notice this odor, you should shut down the main line immediately and call your local gas department or even your fire station. They can perform a test to see if there is indeed a leak. However, you may not pick up on the odor, so you should also know the other warning signs, including headaches and dizziness. If you’re struggling with a sudden bout of headaches that vanish when you leave the house, then a gas leak could be the culprit. You should also listen to your children or other family members if they suddenly complain of chronic headaches or feeling dizzy. Other physical symptoms of poisoning include irregular breathing or fatigue. Once you’re allowed back in the home, you can crack the windows to let the residual gas vent out. For more tips on natural gas visit this site. If you see sparks or flames at any time, then you should not spend time trying to reach the main. Instead, vacate the home immediately and call 911. Get to a safe distance, and then call your immediate neighbors so that they can also get to a safe distance. Unfortunately, the gas to your home will most likely be shut down by the utility company once you notify them. This is to protect the lives and property of your own family and the neighbors. The gas provider will not release the flow again until the lines are pressure checked and certified to be safe. We understand that you cannot go long without this service, so we offer fast response times to fix gas line repairs. Our experienced technicians know how to pressure different lines to pinpoint the source of the leak. We can then make the necessary repairs to get service restored to your home. This may involve replacing a section of pipe completely or simply relining one. We’ll finish your project quickly, and we’ll answer any questions that you may have about the process. You don’t have to surrender your gas lines in order to keep your home and family safe. If you notice any of the warning signs, call the gas company to shut down service while repairs are made. Then give our team a call for quick service, and reliable results. We’ll get your gas lines fixed so that you can rest easy again. Call us at (303)466-4206 or Contact us here.